Many times while sailing, the servo is set to permit the sails to open when there is not enough wind to keep the sheets (sail control lines) taught. Consequently, the sheets are left lying slack inside the radio compartment. Tangling or getting caught on something inside the radio compartment is inevitable. A simple way to avoid the problem is to fabricate a shield that is installed over top of the equipment. A plastic gallon milk jug makes a handy shield platform and, best of all, it's free. Looking at the milk jug photo to the right, the two dots are where the shield is screwed down under the sail servo screws. 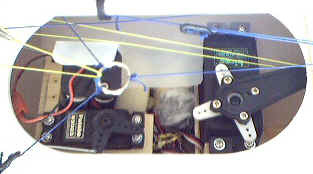 The dashed lines are where the shield is folded up and over (like a stair step) the battery and switch. Curvature of the milk jug conveniently allows the shield to tuck down under the cockpit area and in front of the radio box. Two attempts were required to get a nice snug fit on my Victoria. Since installing the shield, not a single instance of sheet fouling in the radio compartment has occurred.